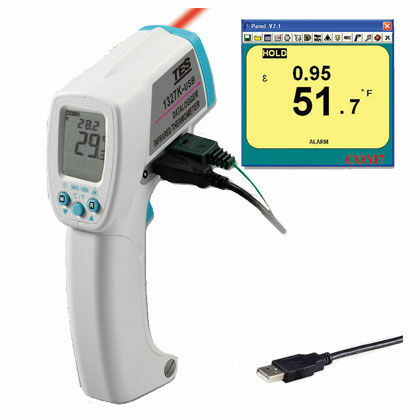 Infrared thermometer / with LCD display / hand-held / with laser pointer - TES-1327KUSB - TES Electrical Electronic Corp. Detection - Measurement > Temperature and Humidity Measurements > Infrared thermometer > TES Electrical Electronic Corp. Stand: TES Electrical Electronic Corp.
TES-1327KUSB TES Electrical Electronic Corp.
• °C / °F Selectable. • Maximum I Minimum function. • Dual thermometer and Dual display. • Audible and visible alarm. • Auto data memory (10000 sets).